Lovingly cared for low mileage Renault Clio I-Music with service history. This Clio has been independently inspected by the AA for your added peace of mind. Low rate, 0% deposit finance available. Please ask for a personal quote. 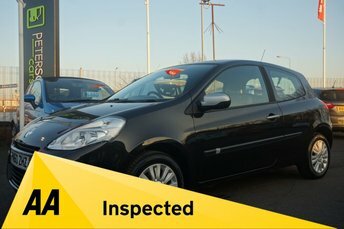 Comes with owners handbooks, service receipts, both keys, full clear Gold HPI Report, 128 point AA Inspection Report, 12 months AA Breakdown Cover,. Please call or message if you require further information or to make an arrangement to view. Few cars have captured the public imagination quite like the Renault Clio. This city car is focused on providing seductive styling, agile handling that makes it a breeze to drive in the city, along with a well-made and comfortable interior that's a pleasure to spend time in. Low running costs also make the Clio an ideal choice for drivers on a budget. Why not come and explore the latest range of used Renault Clio models for sale in Widnes by paying a visit to Peter Scott Cars. At our showroom you'll find an excellent selection of used cars, with options to suit every budget.